Can you start a company on $10K? Nope, not another post on boostrapping, although certainly a big part of this question. 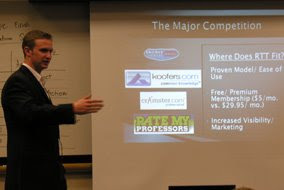 We held our annual business plan competition at San Jose State this month and first prize was $10,000. While difficult to do a lot with, there are a number of non-pecuniary benefits in addition to the cash. First prize went to one of my students, Ryan Guerrettaz (giving the winning pitch below), for his college notes sharing service, Rate-the-Test. I think it's a great idea, although one of colleagues starting calling it Cheating.com and StealtheTest.com. One way to look at it is to level the playing field for those students not in fraternities where old (and probably sometimes current) exams are in the filing cabinet. This is a much bigger idea than that and is really about helping students succeed. Particularly at a school like SJSU, where a large percentage of students are working part or full-time while taking a partial or full load of classes, time is a precious commodity. As a professor, I would also be very open to loading my materials to a site like this both to help students and to share with entrepreneurship faculty at other universities. Ryan was actually working on another business plan for my class when he came to discuss this concept with me a few weeks before the business plan competition. He was concerned that he wouldn't have enough time to do a good job on the business plan in such a short time and asked me to advise him on whether to proceed. As a part-time academic, I had to pontificate and give him the scholarly answer, which was "Why the Hell Not??". He worked over 50 hours the final three days, saw his girlfriend once in three weeks and blew off other activities, but beat the midnight deadline by a few minutes. Rate-the-Test was selected for the semi-finals, which gave him a couple of days to prepare a pitch deck. He did an adequate job presenting and barely made it to the final round. However, this gave him a full week (or 30% of the time already spent) to focus on the presentation and feedback from the semi-final judges. By the morning of the finals, he was ready, gave an excellent presentation, and responded to the judges questions with well thought answers. Back to the question at hand. Certainly, starting a company on $10K is not easy, but it can provide a great start and the motivation to move ahead. In addition to the first prize, he was also given office space at the Plug and Play incubator for the summer and get to spend his days with other entrepreneurs and investors. However, it will be under a different name as it may be hard to get profs to cooperate with a site called Rate-the-Test and the service will offer much more than previous exams. I look forward to seeing my students using this service in the fall semester. Also, if it turns out he neglected his girlfriend too much while starting up the company, he'll certainly have the opportunity to meet plenty of co-eds as he hands out flyers for the site on campus. With $10K, certainly can't have a marketing budget to do anything but guerrilla marketing.